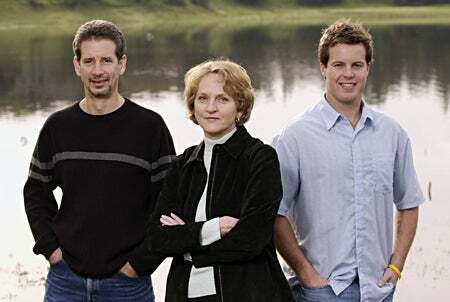 Kevin Arrigo (left), associate professor of geophysics; Pamela Matson, dean of the School of Earth Sciences; and Mike Beman, a doctoral student in the Geological and Environmental Sciences Department, used satellite imagery to demonstrate how agricultural runoff fuels large algal blooms in vulnerable areas of the ocean. This satellite image of the Sea of Cortez was taken on April 6, 1998. Researchers have long suspected that fertilizer runoff from big farms can trigger sudden explosions of marine algae capable of disrupting ocean ecosystems and even producing "dead zones" in the sea. Now a new study by Stanford University scientists presents the first direct evidence linking large-scale coastal farming to massive algal blooms in the sea. Writing in the March 10 issue of the journal Nature, the authors conclude that some highly productive regions of the ocean are much more vulnerable to agricultural runoff than was previously assumed. 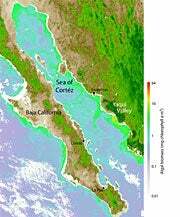 The study is based on satellite imagery of Mexico's Gulf of California, also known as the Sea of Cortez—a narrow, 700-mile-long stretch of the Pacific Ocean that separates the Mexican mainland from the Baja California Peninsula. The area is a hotspot of marine biodiversity and one of Mexico's most important commercial fishing centers. "Biological productivity in most of the world's oceans is controlled by the supply of nutrients to the surface water," wrote the authors, who are all affiliated with Stanford's School of Earth Sciences. "The Gulf of California contains some of the highest nutrient concentrations in the oceans and sustains highly elevated rates of biological productivity." In the gulf, wind-driven upwellings regularly bring nitrogen and other nutrients from the seafloor to the surface, stimulating the rapid reproduction and growth of microscopic algae called phytoplankton. These algal blooms are natural events that benefit life in the gulf by generating tons of phytoplankton—a major source of food for larger organisms. But some phytoplankton species produce harmful blooms, known as red or brown tides, which release toxins in the water that can poison mollusks and fish. Excessively large blooms can also overwhelm a marine ecosystem by depleting oxygen in the water. Scientists suspect that many harmful blooms are artificially fueled by fertilizer runoff from farms, which dump tons of excess nitrogen into rivers that eventually flow into the sea. "There has been an international effort to try to understand the productivity of the oceans and their potential vulnerability to nitrogen," said Pamela A. Matson, the dean of the School of Earth Sciences and co-author of the Nature study. "A map has been developed showing special regions in the world where nitrogen is low relative to other nutrients that phytoplankton need to grow, and the Gulf of California is one of those regions. Our study is the first to show that the addition of human-caused nutrients in these special areas causes extra blooms of phytoplankton." To assess the impact of agricultural runoff on the gulf, the Stanford scientists turned their attention to one of Mexico's most productive coastal farming regions—the Yaqui River Valley, which drains into the gulf. "The Yaqui Valley agricultural area is 556,000 acres [225,000 hectares] of irrigated wheat," Matson said. "The entire valley is irrigated and fertilized in very short windows of time during a six-month cycle. The excess water from irrigation runs off through streams and channels into the estuaries and then out to sea." Matson and her colleagues wondered if each fertilization and irrigation event would trigger a noticeable phytoplankton bloom near the mouth of the Yaqui River, which is located on the mainland side of the gulf. To find out, the researchers analyzed a series of images from an orbiting NASA satellite called SeaWiFS, which is equipped with special light-sensitive instruments that can detect phytoplankton floating near the surface of the sea. "These instruments measure the level of greenness in the water," explained Kevin Arrigo, associate professor of geophysics. "The greener the water, the more phytoplankton there are." Stanford doctoral candidate J. Michael Beman carefully analyzed dozens of SeaWiFS images taken over the gulf from 1998 through 2002. The results were dramatic. "I looked at five years of satellite data," said Beman, lead author of the study. "There were roughly four irrigation events per year, and right after each one, you'd see a bloom appear within a matter of days." Each bloom was enormous, he said, covering from 19 to 223 square miles (50 to 577 square kilometers) of the gulf and lasting several days. "Sometimes eddies actually pulled the plumes across the gulf, from the mainland side all the way to the Baja Peninsula," Beman added. "Mike found that immediately following each one-week window in which much of the valley was irrigated, there was a response in the ocean off the coast of the Yaqui Valley," Matson explained. "We were quite surprised," Arrigo added, noting that the Nature paper marks the first time that scientists have documented a "one-to-one correspondence between an irrigation event and a massive algal bloom." According to the researchers, artificially induced algal blooms could have major impacts on recreational and commercial fishing, major industries in the gulf. Red tides, for example, can cause outbreaks of life-threatening diseases, such as paralytic shellfish poisoning, which can shut down mussel and clam harvesting for long periods of time. Another concern is hypoxia, or oxygen depletion, caused by excessive algae growth. As the algal mass sinks, it is consumed by bacteria, which use up most of the oxygen in the water as they multiply. The result is an oxygen-depleted dead zone at the bottom of the sea where few creatures can survive. A massive dead zone appears every summer in the Gulf of Mexico off the coast of Louisiana and Texas. Scientists believe that agricultural runoff from the Mississippi River plays a pivotal role in creating this annual dead zone, which measured 8,500 square miles (22,000 square kilometers) in 2002—an area bigger than the state of Massachusetts. "In the Gulf of Mexico, there's the possibility that hypoxia could occur at a local scale, which could be devastating to the shrimp and shellfish industries," Matson said. "Shrimp fisheries are very important economically, and they're already under a lot of stress from overfishing and aquaculture. It is possible that agricultural runoff could cause additional stress if it does lead to toxic blooms or hypoxia." She and her colleagues plan to conduct follow-up studies to assess the ecological impact of runoff events in the Yaqui Valley. They also expressed concern about the impact of large farming operations in other vulnerable subtropical and tropical oceans, including Southeast Asia, West Africa, the Arabian Sea and the Bay of Bengal. "Now we can go back and predict which areas of the world will be vulnerable in the same way the Gulf of California is to nutrients coming off the land," Matson said. "Inarguably, the effects of marine nitrogen pollution are becoming extremely widespread and severe as a consequence of the global expansion of industrialized agriculture and the intensification of certain practices," the authors wrote. "Nitrogen-based fertilizers are the primary source of nitrogen pollution, and their use is predicted to double or triple over the next 50 years." The Nature study was funded by the David and Lucile Packard Foundation and the National Science Foundation Graduate Research Fellowship Program.